Moshe Zar, whose son was murdered in Samaria, says IDF commanders need to relearn what 'war' means. 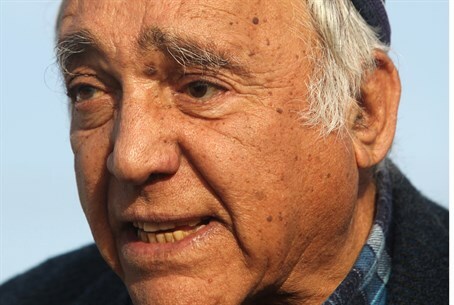 Following the murder of Malachi Moshe Rosenfeld, Moshe Zar, 77, a famous figure in Israel's settlement movement, passionately explained to Arutz Sheva on Tuesday that the IDF needs to start killing terrorists instead of trying to catch them. "This is not a youth movement,” he explained. “It's war. A terrorist has to be eliminated and if the commanders do not know this, let them go back to school and learn what war means." Zar explained that this holds true regardless of whether the terrorist is caught in the act of committing an attack or only chased down later. He expressed outrage and exasperation with orders that say terrorists cannot be shot if they turn their back on soldiers. "Are we sick in the head? ", he asked, and warned that if the IDF does not relearn the art of war soon, it will be defeated. Zar, a wealthy landowner and land dealer in Karnei Shomron, was a member of the elite 101st commando unit under Ariel Sharon in 1956 and lost an eye in combat. He was also a member of the Jewish underground cell that planted an explosive in the car of the Arab mayor of Shechem in 1980. Attacked by an Arab in 1983, Zar survived despite being hacked with an axe and shot at. His son, Gilad, was murdered by terrorists in 2001.